No official description has been listed as of yet. 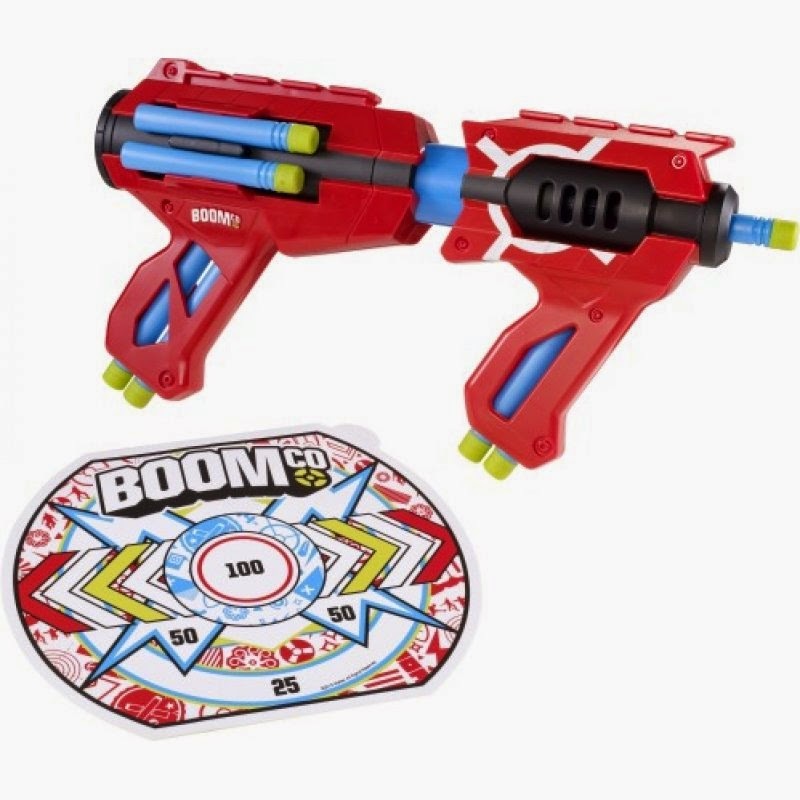 The Mad Slammer looks to be the love child of the Nerf Reactor and the BoomCo Stealth Ambush, with simple push-pull action used to fire the darts and advance the magazine. Not exactly an innovative product, but if Mattel is selling enough blasters to justify bringing out more, then more power to them. Proper Blaster Fun goes so! 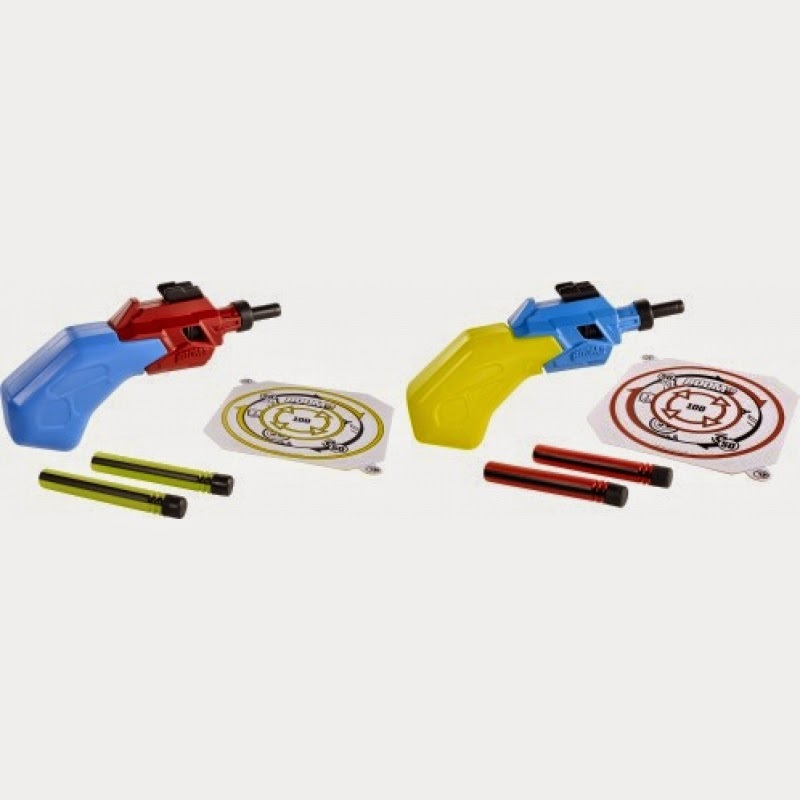 The BOOMCo Products are equipped with the Smart Stick technology, thanks to the darts on BOOMCo.Stick Targets and blaster shields. And you can see exactly where you've hit! The Power Slam darts with mega-launch action can quickly fly up to 18 meters. The faster the darts are fired, the further they fly. 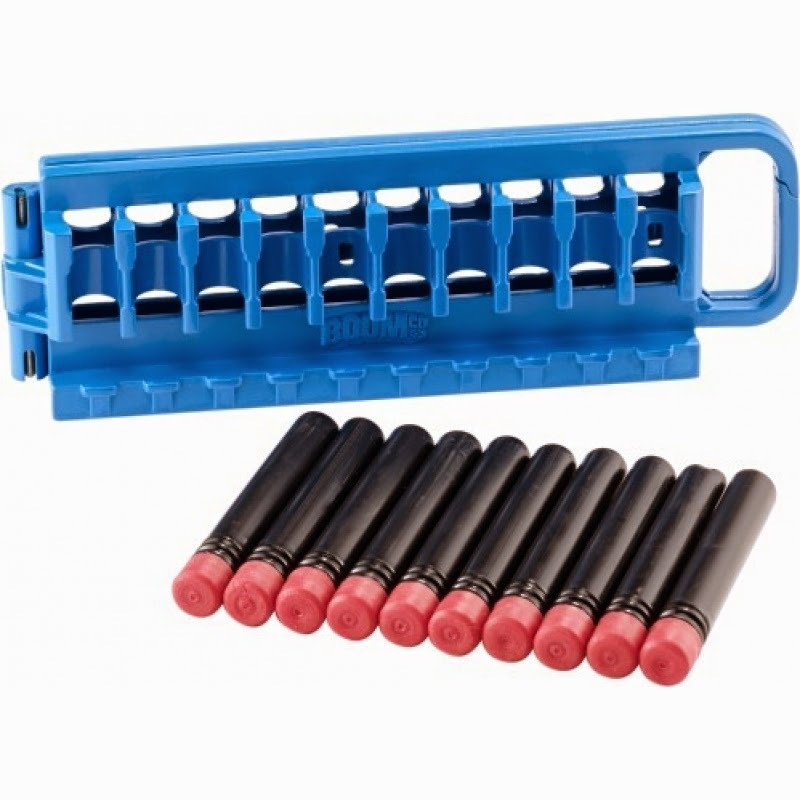 Up to 8 Smart Stick darts fit into the handles and on the sides of the Blasters, via a fastening device for BOOMCo accessories. Power Slam also includes a SmartStick target with adhesive backing for establishment of a separate battle zone. Again, it's a push-pull blaster, but it uses one dart at a time and has a bunch of storage spaces for extra darts. Seems a lot less useful than the Mad Slammer, which at least has an entire magazine for rate-of-fire to make up for the inherent loss of accuracy in push-pull blasting. Proper Blaster Fun goes so! Thanks to the Smart Stick technology adhere to the provided with a special material arrows and bullets on BOOMCo.? - Targets and blaster shields. So you can see exactly where you've made. With the BOOMCo.? Magblast that has a clip system for cool firepower, boys are hitting great in every battle zone. A vertically mounted holder ensures dynamic action. In the clip fit 6 Smart Stick? 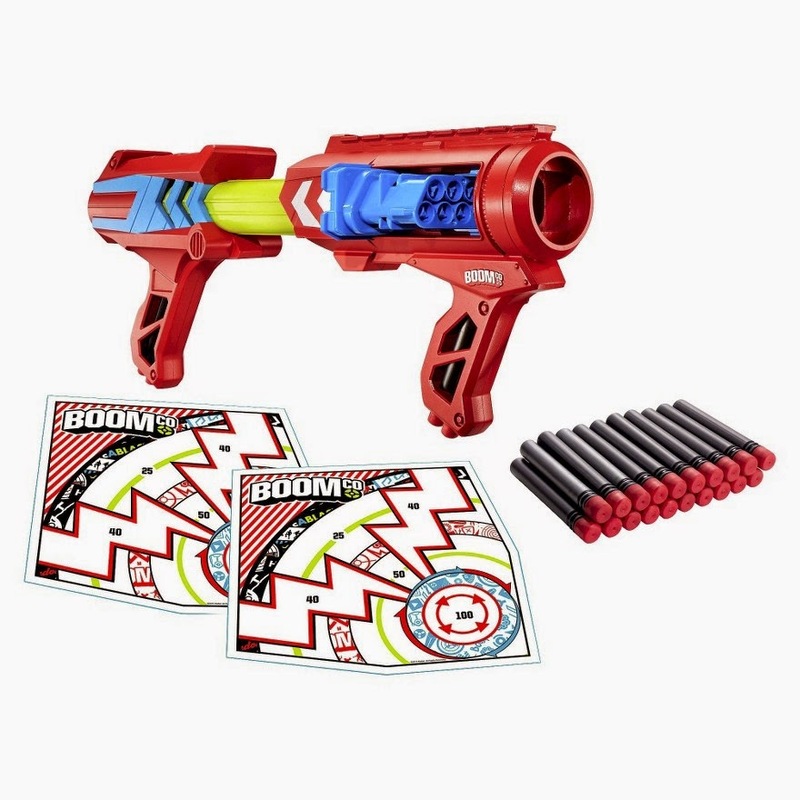 -arrows That fly up to 18 meters.For more action the Magblast is compatible with 20 and 40 arrows comprehensive clips. Thanks to the included SmartStick? 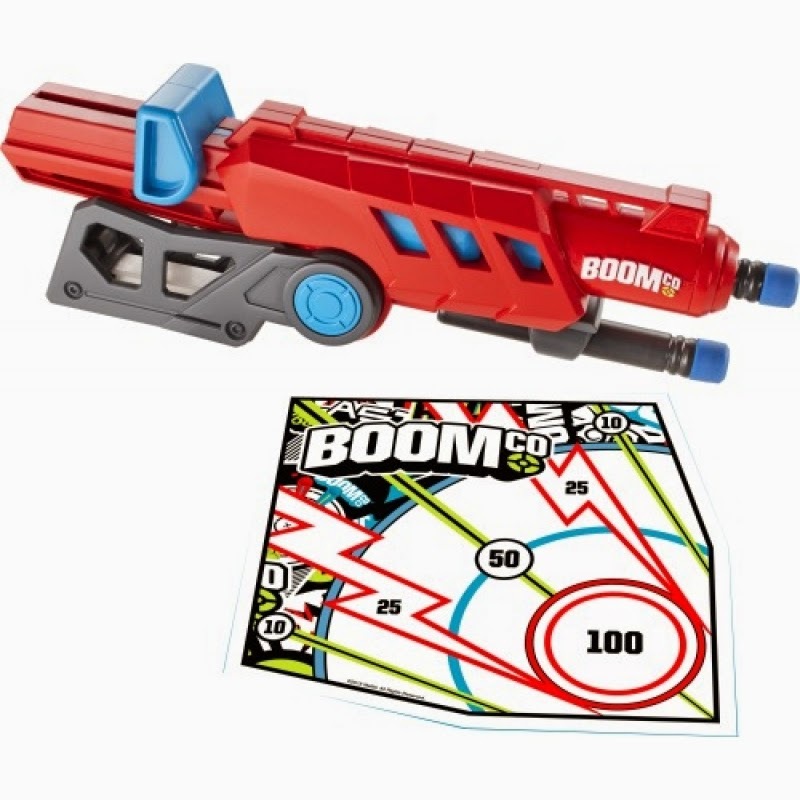 -Zielscheibe With adhesive back can be repeatedly recharged and practiced targets. Additional arrow clips sold separately. From 6 years. * name not final yet. 'Ready for the right blaster fun? Thanks to the Smart Stick technology adhere the arrows and bullets on BOOMCo.? - Targets and blaster shields. And you can see exactly where to hit. The BOOMCo.? Rail Blaster offers two cool game options: Either single fire action for long-range accuracy, or it is attached for double firepower on another blaster. A single Smart Stick? -arrow Flies up to 18 meters? simply spectacular. Easy to load an arrow withdraw the spring located on the blaster up and release to fire the arrow. Or the handle fold up and secure for even cooler action at another blaster. 3 Smart Stick? -arrows And a target with an adhesive back incl. 6 years and over. It's nice to see something creative and useful in such a small package! Since you can kinda interchange these attachments with Nerf tactical rail attachments, this would make for a simple emergency shot. The BOOMCo -.? Products ensure correct Blaster Fun! They are equipped with the Smart Stick technology, so that the arrows and bullets easily on BOOMCo.? - Targets and blaster shields stick and you can see exactly where to hit. 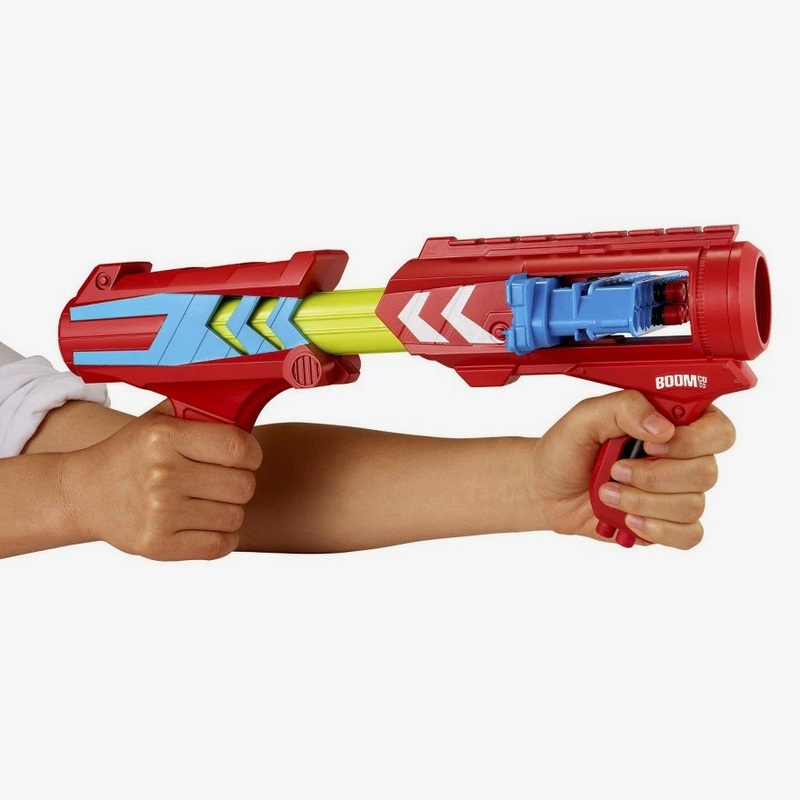 With Squeeze Blast, the small but not to be underestimated Blaster that works in a unique way with air, -arrow flying a single Smart Stick? Of up to 18 meters. For quick reloading fits on top of the blaster, a second arrow.Moreover, is a target for target practice. Easy to squeeze Blast grab the just the right size for Blaster-Fun has the go, squeeze it and fire an arrow. From 6 years. These are for little kids. Unless you fit that description, I'd just stay away. Squeeze blasters just aren't that good. Exactly what it looks like - a dart holder that can clip to your pants. Unsure about whether it can be mounted to the rail of a blaster or not, since we can't see the back of it. Next up will be the various Nerf and Rebelle dart blasters! Stay tuned! These are for little kids, I suppose. However, nevertheless thank you so much for providing these clear descriptions! The article is in sooth stunning. Should we squeeze blasters just if they aren't that good? If you experience difficulties with the translations and descriptions, let us know!